Downtown is an urban area of Miami known as the Central Business District (CBD) and located approximately from NE 6th Street south to the Miami River and Biscayne Bay west to NW 7th Ave. The area was incorporated in 1896. Downtown Miami is the oldest settled area of Miami. The construction and urban development of Downtown began in the 1890s with Henry Flagler’s Florida East Coast Railway and the assistance of Julia Tuttle, William Brickell, as well as George E. Merrick that helped bring interested developers to the area. The major east-west road in Miami called Flagler Street is named after Henry Flagler for all of his contributions to the development of Miami. The Julia Tuttle Causeway, named in her honor, crosses Biscayne Bay just north of Downtown from the Edgewater and Wynwood area to Miami Beach. Downtown is home to some of the oldest buildings in Miami, major museums, parks, government offices, courthouses, theatres and shops, and corporate headquarters as it is the historic core of Miami. The area is directly served by the Miami Metrorail at Government Center Station and by 13 Metromover stations in Downtown and Brickell. Some of the Downtown neighborhoods include Park West, Omni, and the Miami Jewelry District. Park West is located just west of Bicentennial Park and is primarily known for its night clubs, however this area has been undergoing changes to refresh the neighborhood. Omni is located north on Biscayne Boulevard and recognized for its high-rise residential buildings, various hotels and the Adrian Arsht Performing Arts Center, which includes The Ziff Ballet Opera House and Knight Concert Hall. The Miami Jewelry District is located within the Central Business District, the core of Downtown Miami, and known for all of its jewelry stores. Shoppers can visit the Miami Jewelry District and find all types of jewelry products, from designer jewelry to local gem dealers. Downtown Miami is also home to consulates of several countries such as Canada, Argentina, United Kingdom, France, Japan, Peru, Venezuela, Brazil, and Chile. These consulates are located along Brickell Avenue and Biscayne Boulevard. Downtown Miami is also home to several chambers of commerce. There are three historic districts in the area: The Downtown Miami Historic District, The Downtown Miami Commercial Historic District and the Lummus Park Historic District. The buildings within these districts show styles in architecture ranging from Classical Revival, to Moderne Style and Art Deco. The buildings range from styles between the 1900s to the 1970s. The Downtown Miami Commercial District is located on the east side of Downtown. The Lummus Park Historic District is located west of Downtown with buildings mostly owned by the local government and private entities. There are several attractions for anyone visiting Downtown Miami. Some of the parks located within Downtown Miami include Pace Park, Museum Park and Bayfront Park. Museum Park, formerly known as Bicentennial Park, opened in 1976 and is located just south of McArthur Causeway and east of Biscayne Boulevard. The park originally hosted several large events such as music festivals. Today, Museum Park is part of the Perez Art Museum Miami (PAMM) and it will be the new location to the Patricia Frost Museum of Science. 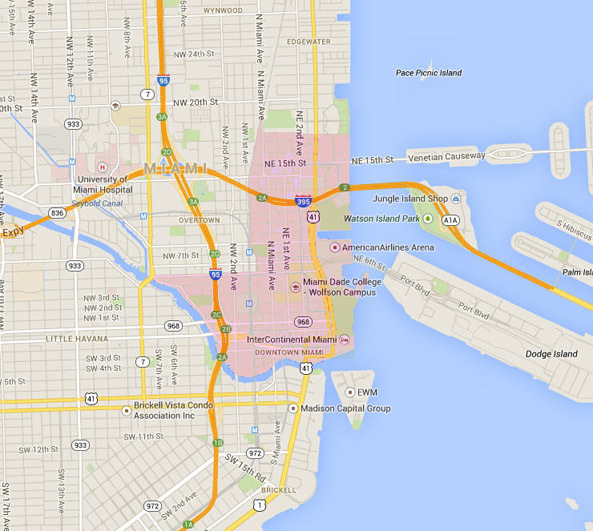 Bayfront Park is a 32 acre public park located south of Bayside Marketplace and the American Airlines Arena. The park also hosts several major events throughout the year. Bayside Marketplace is a large shopping center with several restaurants. The American Airlines Arena is a sports and entertainment arena and home to NBA’s Miami Heat. Some of the designated schools for the area of Downtown include Downtown Miami Charter School, Ada Merritt K-8, Riverside Elementary, Bridgepoint Academy of Greater Miami, New World School of the Arts, and Booker T. Washington High School. New World School of the Arts, or NWSA, is a public magnet high school focusing on visual and performing arts, such as dance, theatre, instrumental and vocal music. Miami, “The Magic City”, is always changing and evolving. There are several upcoming projects that will be adding to the city’s skyline. The night life in Downtown is a popular destination. The history, culture and diverse population are what make Downtown the heart of Miami. If you have any interest living in Downtown, contact us and we will assist you with your real estate needs.